How quickly do you forget how to drive fast? After a seven month hiatus from track driving in Austin, I took my 1991 Miata back to see what I would remember. It was immensely frustrating – I’ve been logging thousands of miles in a Vauxhall Insignia in England and a Toyota Prius in the US dreaming of the track, and after today’s visit, I thought all skill was lost. The numbers tell a slightly different story, which I didn’t learn until I got home and tapped the lap times from three sessions this year into OpenOffice. Despite five of my gauges giving up the ghost after the first few laps, and precious little instruction or YouTube study, I posted my best ever lap time today, and the consistency of the hot laps was higher than I had thought. Driveway Austin in a Miata. Between sessions one and two I had added Kumho tires on larger wheels – Kumho XS 205/50/15 on Team Dynamics Pro Race 1.2, 25mm Matte Black 15×7 rims to be precise which probably accounts for the 1.5 second improvement between those two sessions. Between session two and today though, nothing material had changed. I may have gained a few pounds and grown a beard and charged the AC system, but nothing else. It’s interesting to see how effortless the course owner and race instructor makes the track look. He doesn’t botch any gear changes or use his clutch mid-corner. So, mental note to self. Fix the dials on the car. Then practice some heel-and-toe downshifts. And get back out there with more telemetry. And maybe some more instruction. So I went today, 14th May 2014. The engine in my Miata has been replace with another – equally old, a similar number of miles but without the oil slick emanating from the oil pump area. Theoretically, compression should be more consistent between the cylinders since this engine doesn’t leave clouds of smoke behind. I was far less consistent today, trying to remember the line of the course. And my best time was bizarrely on lap 4, while I still wasn’t trying to go too fast. 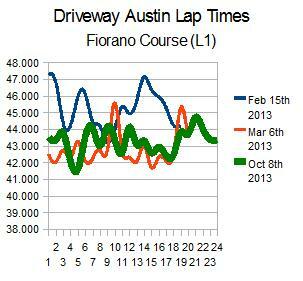 I missed every downshift, and my best was 41.121 seconds after a gap of 8 months again. I’d really like to get that to 40 seconds, and I’ve only got 4 weeks to do it.